Paris Day 21: Maybe New Hair? Full confession: Liam, the hair stylist with the captivating chest hair, is one of the most gorgeous people I’ve ever seen. Alas, he’s maybe twenty-five and gay, but OH MY, OH MY. Today, he had a lovely five o’clock shadow, something I’ve always been a huge fan of (Bug is very indulgent and leaves his face scruffy for me), and the tightest, skinny cord pants I’ve ever seen a man pour himself in to. *Sigh* Maybe in my next life, I’ll live out my fantasy of dating skinny rocker guys. I wish I had had the courage to ask him for a picture, but it felt weird. 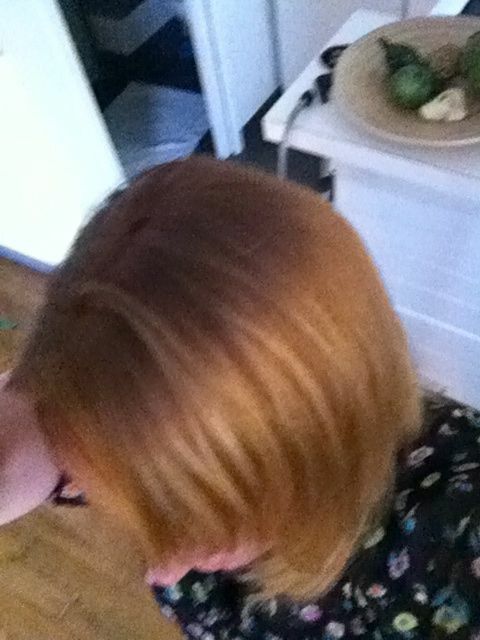 Anyway, he decided he LOVED my strawberry blond hair. He kept saying how hard it is to get a color like mine and was I positive that I wanted to change it, because really, it would be a shame. Eventually, he decided to “tie and die” it. He darkened the roots slightly, backcombed the ends, and then put a lighter shade on those. The middle he left as is. The result is cool. The pictures aren’t great because I was trying to hold my phone over my head. 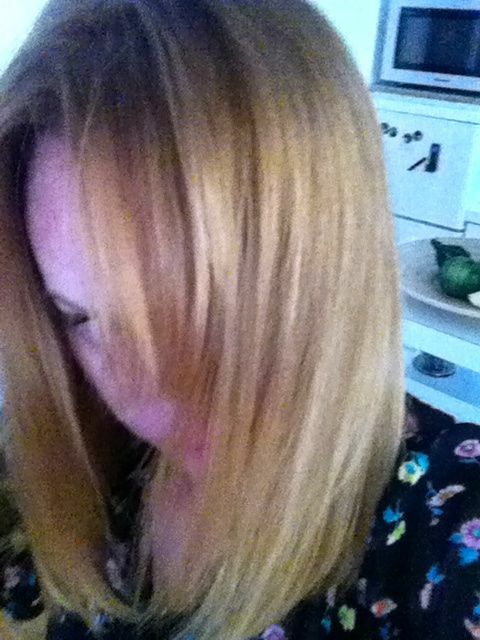 It’s darker on the top and more golden red. Completely unrelated – the other night Bug and I came across this bridge behind Notre Dame. 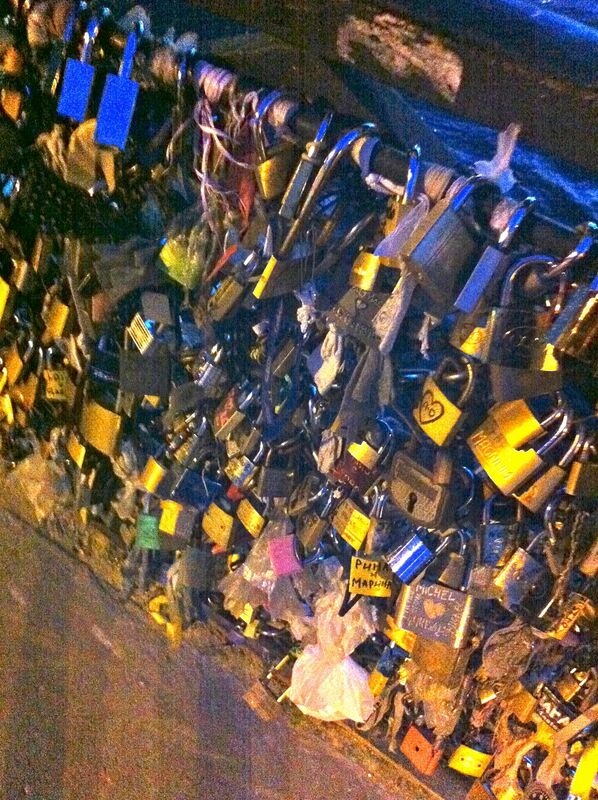 Couples write their names on a lock and attach it to the bridge. 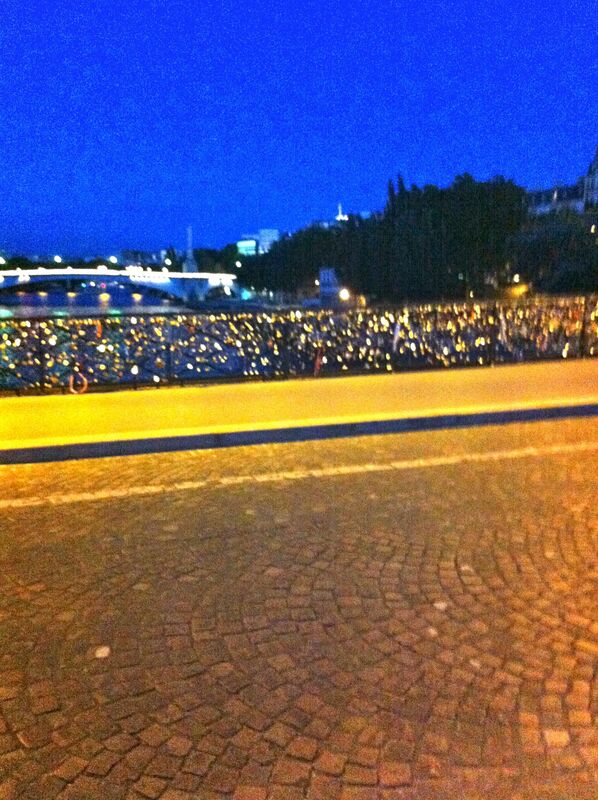 From a distance, it looks like the railings are strung with hundreds of glittering lights. Speaking of Bug, he’s on his way back to San Francisco for the weekend. He’ll be back on in Paris Monday. My plans for this weekend include revising Nightingale, revising Nightingale, and…oh revising Nightingale. The only other plan I have is seeing my therapist on Saturday. I suppose it seems odd that I flew all the way to Paris and have a therapist I see twice a week, but I’m thankful my husband found her. She’s helping me feel a little less crazy, and while I still have horrible anxiety and not-the-greatest thoughts, I am learning how to cope in better ways. 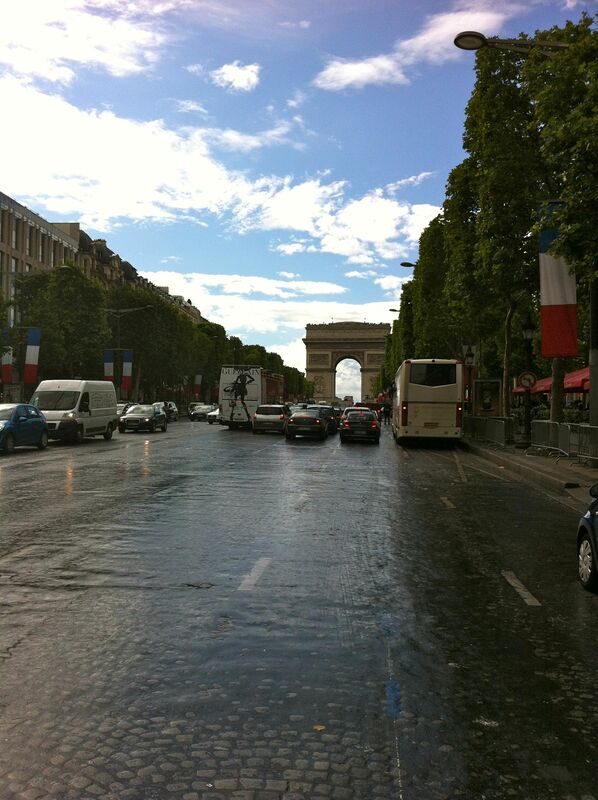 Speaking of my therapist, here’s a picture of the Arch de Triumph on the Champs Elysee. Her office is located there and Bug stood in traffic trying to snap this picture for me the other day.